Shetland. Rife with murder, people trafficking, lye, lies, floating bodies, injurious writing implements and Glaswegian actors pretending their glottal stops are actually aspirated fricatives. And an insufficency of sheep, in this series. What is Shetland without sheep? Well, Ayrshire, actually, where large lumps of this bizarrely-scripted mish-mash of Taken, Baptiste, 1000 Acres of Sky and the first series of Trapped were actually shot. Anyway, here we are again and after that drone shot last week of Drunken Duncan waking up on a beach to find a whole heap of bodies floating ashore, the end is well and truly nigh. This is where we find out who's been leaking, where the red herrings (or salmon, cod, whiting, piltocks or whaddocks) have been lurking, and if we're going to have to put up with crew and cast descending on us again in the summer. Or whether they'll cut their losses and film the whole jing bang in Glengarnock. But, hey, suspend/upend your disbelief this instant! And Tom, dissipate your cynicism! This is television for those who don't live in the actual Shetland, or indeed anywhere bonny. It's a fantasy, a cozily spectacular character- landscape where all the horrors of the world can be dumped, allowed to send delicious shivers into those Farrow and Ballsed living rooms and then solved, wrapped up, packed comfortably away by Taggart-channelling coppers in pea jackets and Barbours. Not so much Brigadoon as Brigadoom. Off we go, then. Big bad beardieman is deid. Zezzi is still missing. And there's an incident at Spiggie Beach (Drunk Dunc's bed for the night, and what a title for a novel: The Spiggie Incident). "Four men, death by drowning" says fantasy physician Cora, who knows her stuff. Three from the middle east, one of North African origin. And there's a leak on the team. Or Gallus Alice. Wait a minute, though, what about male model semi-detached hubbie Chris? He used to work in Angola. That's in Africa. Or Anguilla. Which isn't. Can't tell from the accents. Security camera image of someone stuffing a knife down the drain at the guest house, thus implicating Olivia in some murder or other. Cassie's off on the ferry with her smitten junior polis cadet. Sandy still hasn't been suspended. But he knows about the mysterious Nigerian Black Axe Gang of Benin (note: this is a real gang). Wait another minute! The Chief Constable has recommended that Sandy be suspended. But Jeemie isnae going to tell him. He's the only native Shetland speaker on the force! He can't leave! Tosh meets her paramour, Nerdy Boy, who it now appears is working at the fish factory and has proof that workers there weren't getting paid. Or something. Instead, Northlands Ltd was getting paid - and it's registered in the name of Alice! Background check on Alice and Chris, immediately! Don't tell Sandy he's gonnie be upended. Oh ho, and if you will, ah ha - Chris was sharing a tattoo parlour or something in Glasgow with Dodgy Mrs Boyle! And he worked in Nigeria, not Anguilla . Alice, what do you think? Nigeria? Isn't that a country in Africa where there's a mafia gang called The Black Axe? Says so on Wikipedia. Alice, confess! Do you think I'm trying to compromise you, Jeemie? Nah, ah pure fancy you, doll. Right, let's pick up Chris and get him out of the way. Hey Chris! Ever been to Benin City? You wouldnae be trying to ruin me so you could steal my wife? WE HAVE NOT SHAGGED! How dare you suggest such a thing! Oh, Chris hasn't been offshore at all. Well, actually he has, but he's been in Yell (an island in the Shetland group), trying to upgrade his house. Let them have builders! He was not employing slave labour either. This is harassment! Jeemie doesn't buy it. Not without a surveyor's report. Might be a bargain, though, so off he goes to Yell for a gander. Chris is free to go, followed by an unsuspended Sandy. Not in the least obviously. Unsuspected. Aye, right. Jeemie's in the suspect hoose in Yell. Chris is in The Lounge (a pub). Olivia's taking pills in the bath and is heading for oblivion. Zezi has written her name in sawdust. But more important than that THERE IS LYE UNDER THE SINK! Zezzi's in a cupboard. She's safe now. Jeemie phones Olivia who marvellously, magically and entirely stupidly awakes from her drowned state. Sandy (still unsuspended) is to arrest Chris Brooks "I need backup at The Lounge, now!" How many hundreds of times have I spoken those words? Chris has done a runner from a completely different pub in Ayrshire. Och well. Zezzi identifies Chris as a seriously bad man whose house in Yell is definitely not worth offering on. Also, your brother's dead. Do you want to see your mother? No. Bring Alice Brooks in for questioning. I wish to flirt with her in a doom-laden and tragic way. "This doesn't make any sense! You must have got this wrong!" Alice, we know the feeling. It's television, get used to it. Jeemie and Alice look like they're not going to shag after all. And neither do Tosh and Nerdy Boy Runrig fan. Duncan is selling up "Is that your idea or Graham Benson's? You're being played." Chris is down by the harbour. On a boat. It's the big confrontation between Chris (who's got a knife) and Jeemie. "Call that a knife? THIS is a knife!" Phallic symbolism agogo. "Ah didnae wreck yer marriage Chris. You did when you started trafficking people!" Tell that to the marriage guidance counsellor. Come ahead, McQuillan! Or don't bother. But he had nothing to do with Hayes case. Of course not. Charge McGuire, Laird and Brooks, says Rhona. "It's just a drop in the ocean," says Jeemie. Is he trying to be funny? As for the Hayes, it's back to the CCTV. Try the camera in Market Cross...Oh hang on! Isn't that...Rosie! Turns out it was all Jeemie's idea in the first place. Or Jamie's. Jamie (not Jeemie) and Rosie were in on it together and Rosie killed his mum and brother. But he pure fancied her anyway so he (Jamie not Jeemie) didn't care. 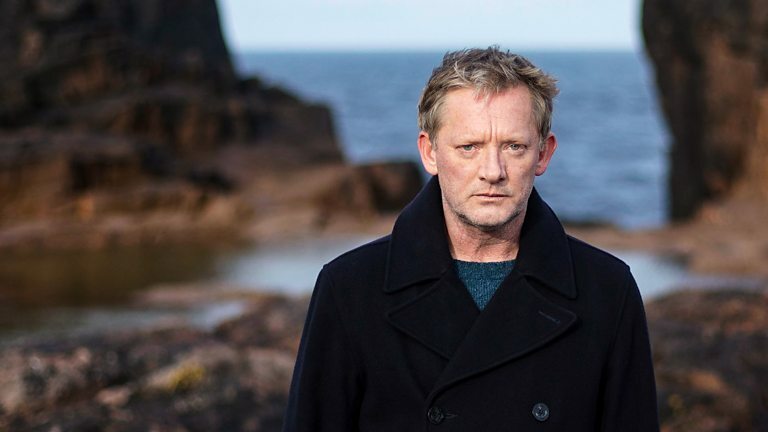 More murders in Shetland this series than in the last 100 years or so in real life, by the way. Good grief, there's still ten minutes to go. Zezzi and her mum have to meet. They do. Sunny day on the Knab. What is this? "I would give you a pullover again to keep you safe." What? Oh, I would give you up all over again." Or maybe there was a real need for knitwear. There often is in Shetland. Sandy has been suspended! At last! Steven Robertson might be heading for proper acting again! That looks like an awfully final flounce out. Tosh and Nerdy Boy - "stay and sleep with me though I wear socks in bed," she says, romantically. Alice blames herself. Her and Jeemie? "But you suspected me of murder and people trafficking! And this is Shetland, where vikings burn their wives!" Our secret's out, folks. Remember that if you're thinking of moving to the isles. "Come over and I'll cook you dinner and we can talk about your lying murdering husband over some lasagne" No. Och well, there's always Duncan, waiting at home. And pizza. There's some football talk. World Cups. Scotland. Don't go Duncan. Ah pure love you! Take ma money, I want to be a partner in your bistro. I know some people at the licensing court. Ah'll dae security. And that's it. It was all a dream. Or a lye.